This statistic displays the annual exchange rate (average or standardized measure) of the euro to the Polish zloty (EUR PLN), according to data from the European Central Bank, from the introduction of the euro in 1999 to 2018. The average, or standardized, measure shows the calculation based on many observations throughout the period in question, which is different than an annual measure at point in time: this denotes concrete values as of the end of the year. 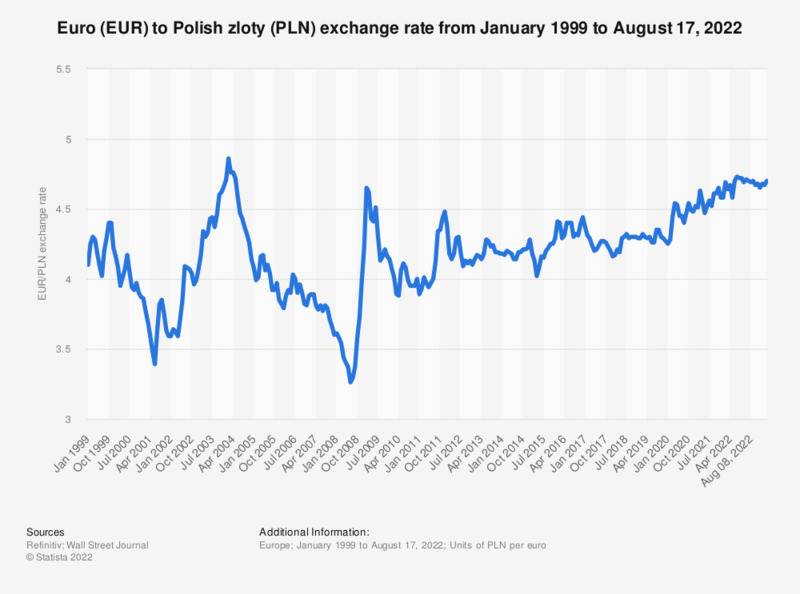 Between the years of 2001 and 2004, the average annual exchange rate of the euro to the Polish zloty noted a steep increase. In 2004, the euro to Polish zloty annual average exchange rate was equal to 4.53, which meant that one euro could buy 4.53 Polish zloty. It dipped at the height of global recession, in 2008. Between 2010 and 2016 the value increased overall, to 4.36 which meant that one euro could buy 4.36 Polish zloty before falling once again in 2018 to 4.26 Polish zloty. This overall increase in an average annual euro to Polish zloty exchange rate is also reflected in the monthly exchange rate in recent years, although in this case the values are measured at one point in time (end of month).